Beth Photography - Pet Photography - Servicing the Ottawa, Cornwall area and everything in between. - Beth Photography - Pet photography blog about different subjects surrounding animals and pets. Celebration of Life Pet Photography Session - Beth Alexander is a Pet Photographer that services Ottawa to Cornwall and everything in between! A “Celebration of Life” pet photography session helps people mourn and encourages people to focus on the positive aspects of the life lived. Luv luv luv the mobile service of Purdy Paws. I have two cats and it was always very stressful time when they get trimmed. Now Purdy Paws come right to our door and text me when its time to bring out the second cat. They only spend a minute travelling and are so adorable. Bye bye fur balls. Highly recommend. Truly the best cat groomers. 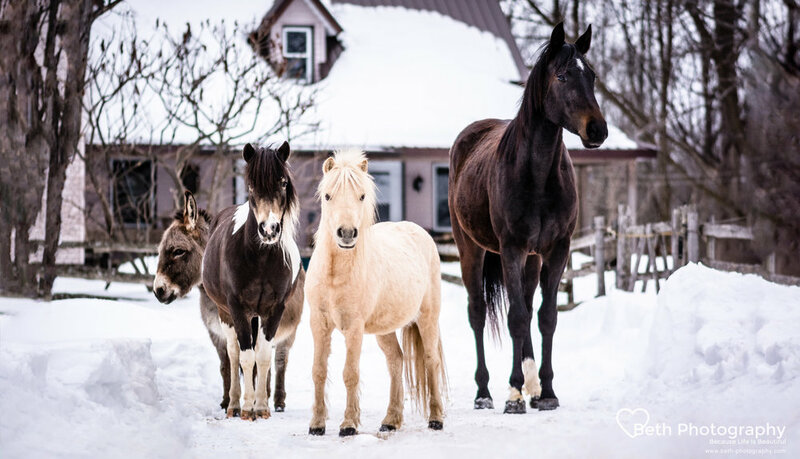 Pet Love Winter Project-Horse Photographer that services Ottawa to Cornwall and everything in between! Horse Shedding Season Tips and Tricks - Horse Photographer that services Ottawa to Cornwall and everything in between! It’s that time of year – shedding season! It’s always fun to see a horse’s coat go from wooly to smooth and sleek. But, there is a down side. 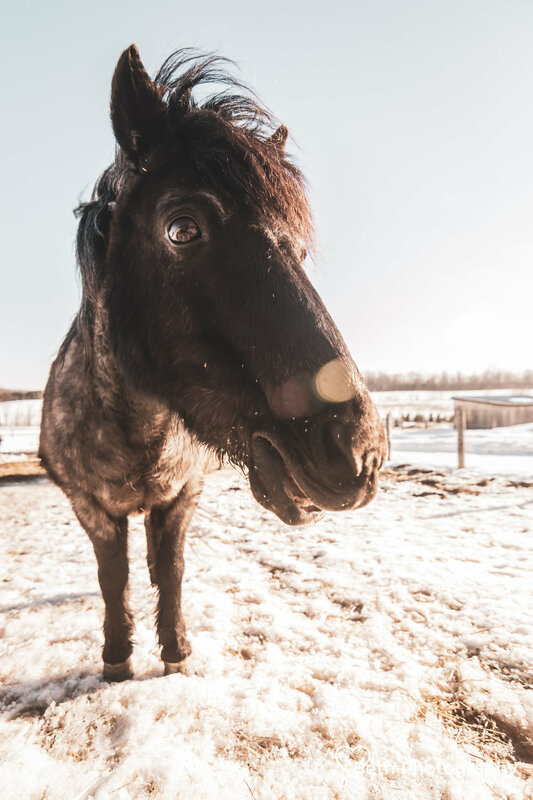 All that fur coming off is itchy and your horse may be rubbing on everything, to the point that they are rubbing off manes and tails – not good! I’ve rounded up some helpful tips to ensure your horse is as comfortable as possible during shedding season so they can welcome summer with a shiny, healthy coat. Horses start to shed when the day length increases. To encourage them to do so earlier in the season, artificial lighting can be used in the stall to mimic natural spring day length. Additionally, a late season full body clip will make hair shedding less obvious and can also remove some dead hair follicles. However, if it’s still cold out remember to blanket your horse as you’re getting rid of their warm winter coat. To encourage shedding, a soak overnight can loosen dead hair follicles followed by a shampoo bath. Bathing can help remove dead hairs and encourage shedding, but be careful not to over-bathe your horse. This can decrease natural oils and result in a dull coat or make your horse more prone to dermatitis. The thing you’ll need the most of to help your horse shed is “elbow grease.” It will take some regular, vigorous, daily brushing to help shed a thick winter coat out. This is common in older horses but does warrant further treatment. Should your horse be having difficulty shedding or show other coat abnormalities, consult your veterinarian. Pay attention to whether your horse enjoys the grooming process as much as you do. Do they fuss around and have a hard time standing still while being groomed? Perhaps they aren’t as comfortable with the process as they could be. If not, you may need to work on handling with your horse to make it a less stressful experience. As for skin and coat health, a well-balanced diet with an appropriate mineral and trace mineral supplementation is important for overall health including skin and coat. Curious about having your pet’s picture taken? Why I volunteer - Beth Photography - Pet Photography Servicing the Ottawa to Cornwall area. People choose to volunteer for a variety of reasons. For some it offers the chance to give something back to the community or make a difference to the people around them. For others it provides an opportunity to develop new skills or build on existing experience and knowledge. Whatever the reasons you choose, get out there and volunteer! You won't regret it! When Did Your Love for Animals Begin? Can you remember when this feeling was awakened in you? Spring has finally sprung! Everyone wants to start spring cleaning, but household cleaning products can be very dangerous for your pets. Bleaches and soaps can irritate your pet's skin and can be deadly if ingested. Keep all cleaning supplies stored safely away and ensure your pet has been removed from the area where you are cleaning. Pet Love Winter Project- Beth Alexander is a Pet Photographer that services Ottawa to Cornwall and everything in between! Adopting Shelter or Rescue Animals - Beth Alexander is a Pet Photographer that services Ottawa to Cornwall and everything in between! Tips on choosing a RESPONSIBLE Breeder - Beth Alexander is a Pet Photographer that services Ottawa to Cornwall and everything in between! How to find a RESPONSIBLE breeder! Meet Rio, Ryder and Dax the charming, Quirky talented Australian Shepards. Black & White Project- Beth Alexander is a Pet Photographer that services Ottawa to Cornwall and everything in between! To see in colour is a delight for the eye but to see in black and white is a delight for the soul. HERE ARE A FEW THINGS TO CONSIDER WHEN SELECTING THE BEST LOCATION FOR YOUR PET PHOTOGRAPHY SESSION IN OTTAWA OR ANYWHERE REALLY! I hope that my story will prompt you to think about this subject and put things into place to protect yourself.